Line an 8-inch round cake pan with parchment paper and evenly pour batter into cake pans. Bake at 350 for 30-35 minutes until a tooth pick inserted in the middle comes out clean. Once the cakes have cooled, use a cake leveler to gently cut off the rounded part of each cake, making a flat surface. 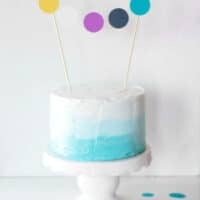 Line a cake stand with parchment paper. Place the bottom layer on top of an 8-inch cake board and spread ½ cup of frosting to the edges using an offset spatula. Place the second layer on top and spread another ½ cup of frosting. Repeat with each of the layers. Top the cake with a thin layer of frosting. Divide the remaining frosting into 3 bowls. Add 1 drop of turquoise food coloring to one of the bowls and stir well, making sure all the frosting has been colored. To the second bowl, add 2-3 drops of food coloring and stir well. Leave the third bowl white. On the bottom of the cake, add the darker turquoise color and spread evenly around the bottom of the cake. Then use a frosting spatula to make the frosting smooth. Around the middle of the cake, just above the darker layer, add the lighter color. Clean the frosting spatula and use it to evenly spread the frosting around the cake. Spread the white frosting around the remaining top portion of the cake. Clean the frosting spatula and use it to evenly spread the white frosting around the cake. Place butter in the bowl of stand mixer fitted with the whisk attachment. Cut a slit down the middle of the vanilla bean and scrape out the beans with a paring knife. Add to butter. Add powdered sugar and mix on low until well combined. Then turn on high for 2-3 minutes. Use the hole punch to make circles. Tie the string around the top ends of the skewer. There should be about 2 inches of string between the top of the skewer and where the first circle starts. Tape down the string to the skewer after you have tied it. If the garland hangs too much, you can turn the skewer, wrapping the string around it to make the garland hang higher. Stick the skewers into the middle outside edges of the cake.